The Havelock Theatre Company was founded by actor/playwright Don Edwards in January 1999 in Havelock, Marlborough, New Zealand. The first production was “The Haunted Through Lounge and Recessed Dining Room at Farndale Castle” by David McGillivray & Walter Zerlin Jnr, directed by Don and starring Julie Tidy, Rick Edmonds, Paula O’Donnell, Jaine Cronin, Mike Mullord, Josie Blackadder and Natalie Roberts. Since then, there have been two productions per year (twenty-five to date and counting), most of which have been written by local people. Early plays included Dr Cassavent, Wakamarina Gold 1 & 2 and Once A Happy Cowboy written by Don Edwards and the Bob & Billy Trilogy, Place in the Sun, Johnny Castaway and Bob & Billy's Big Adventure by Rick Edmonds. For a full list see the “shows” tab. In 2009 one of these plays “Two Weddings and a Funeral” written by local writer and artist Rick Edmonds won the New Zealand Theatre Federation Top of the South Festival .The play went on to be placed second overall at the South Island Theatre Federation Festival at Dunedin that year. One of the cast won an award for most promising actor. In 2010 and again in 2013 the Company won the Trust Power Marlborough Community Awards for Arts and Culture. The citations commented that The Havelock Theatre Company provided the community with top-class theatre and has added to Marlborough’s strong reputation as a region with a vibrant theatre culture. We have put our prize money towards replacing the curtains over the Proscenium Arch which will enhance the architecture of the early 1900s of which we in Havelock are justly proud. We are grateful to the Havelock Mussel Festival Committee, Marlborough District Council Arts and Heritage fund and Theatre New Zealand for their support. As a result of their generosity we have been able to purchase items for the Town Hall that benefit all users. Our shows are presented with cafe-style seating. Bring your own nibbles and drinks to enjoy during the evening. Tea, coffee, and tasty snacks also can be purchased before the show and during the interval. This service is operated as a fundraiser by one of our fellow community groups. 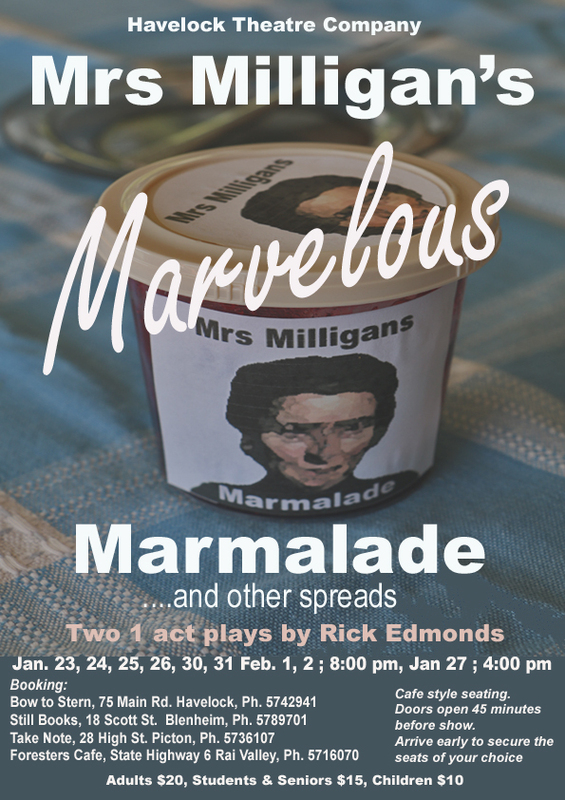 Two one-act plays, "An Affair of the Art" and Mrs Milligan's Marvellous Marmalade" are the next productions for the Havelock Theatre Company. The season runs from Wednesday 23rd January to Saturday 2nd February. Get your tickets at one of these outlets, tickets are now on sale. We will also have Door Sales on the night of the show. Arrive early to select your table. 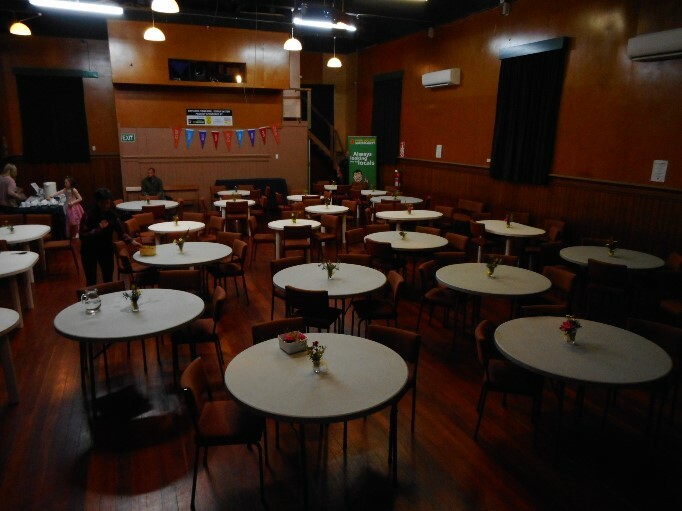 At the Gala opening night we are lucky to be able to offer you wine and finger food sponsored and supplied by Bladen Wines and Havelock's Slip Inn Restaurant. The wine will be available as you enter the Hall, and the snacks will be available at the interval. Ticket prices are $20 for adults, $15 for students/seniors, and $10 for children. For more information view the poster here.